A two-time World Series winner with nine Silver Slugger Awards to his credit, Manny Ramirez has joined the rank of players who left their home country for the United States to reach the greatest height of the game of baseball. Ramirez is a former professional baseball player from the Dominican Republic. He enjoyed an illustrious trophy-laden career, spanning over 19 years with different teams. During his playing days, the Dominican-American outfielder was recognized for being a complete hitter who possesses great batting skill and power. He also set as well as broke a myriad of MLB records including being one of 25 players to hit 500 career home runs with 29 postseason homers, the most in the League history, making him arguably one of the greatest players that baseball has ever seen. Here are all the other amazing facts you need to know about the former baseball player. On the 30th day of May 1972 Manuel Arístides Ramírez Onelcida the batter was born in Santo Domingo, the Dominican Republic to Aristides and Onelcida Ramirez. He lived there until he debuted into his teenage years in 1985 when the family moved to the US. It was also there that he got enamored with baseball and received one of his most prized possessions, a Dodgers uniform with the number 30 on the back. It was agoft from his grandmother when he turned 8. His interest in the sport did not wane with the migration, rather, he became even more determined to carve a career therein with the family living in New York City. He often played and would watch the Toronto Blue Jays games whenever they are in town, despite living a short distance from Yankee Stadium. He attended George Washington High School but left in 1991 at age 19 to enter the League without graduating. He played on the school’s baseball team where he became a standout, leading his team to three consecutive division championships. He was also a three-time all-city selection and in his senior year in 1991, and was named New York City Public School Player of the Year. That season, he hit for a .650 batting average with 14 homers in 22 games. Years after his high school career, he was inducted into the New York City Public School Athletic Hall of Fame in 1999. Ramirez was drafted by the Cleveland Indians with the 13th pick in the first round of the 1991 MLB draft and debuted in the major league on September 2, 1993, and played with the team until 2000. His 19 explosive MLB seasons career would also see him play with different teams including the Boston Red Sox (2001-2008), Los Angeles Dodgers (2008-2010), Chicago White Sox in 2010, and then the Tampa Bay Rays in 2011. Besides the MLB, he also played one season in the Chinese Professional Baseball League. Throughout his playing phase, he was recognized for having had great batting skill and power. Among the awards and recognition, he is a nine-time Silver Slugger and was one of 25 players to hit 500 career home runs. He had 21 grand slams and is ranked third all-time, also he recorded 29 postseason homers which holds the position of the most in the League history. Moreover, he also appeared in 12 All-Star Games. Manny Ramirez is widely regarded as one of the best right-handed hitters of his time. He finished his career with a lifetime .312 batting average, 555 home runs (15th all time), and 1,831 RBI (18th all time). From signing $250,000 in his first MLB contract, Manny Ramirez finished his career as one of the highest paid athletes. He signed an eight-year, $160 million deal with the Boston Red Sox in December 2000 and in 2004, was leading the American League in salary at $22.5 million. He went on to sign other multi-million dollar contracts with the other teams he played with. He has an estimated net worth of $110 million and a salary of $500,000. Manny Ramirez is married to Juliana Ramirez since 2001. The baseball player and his wife have two children together; Manuelito “Manny” Ramirez who was born in 2003 and Lucas Ramirez born in 2006. However, he also has another son, Manny Ramirez, Jr. (1995) from a previous relationship. Manny Ramirez Jr. is already following in his father’s footsteps. As of May 2018, he is a member of the New Britain Bees of the independent Atlantic League of Professional Baseball. 1. Manny Ramirez was suspended twice during his playing career. First time was in 2009 for 50 games for violating the sport’s drug policy by taking a women’s fertility drug usually taken after steroids. Then a second time for 100 games in the spring of 2011 after another violation of MLB’s drug policy although it was reduced to 50-game in December. 2. Following the reduction of the second suspension, he was reinstated into the league but did not appear in another big league game. However, he played at various points in the minor league for Oakland Athletics, Texas Rangers, and Chicago Cubs systems, as well as internationally. 3. He became a naturalized citizen of the United States on May 11, 2004. 4. He is a two-time world series champion (2004, 2007) with the Red Sox and a World Series MVP in 2004. 5. 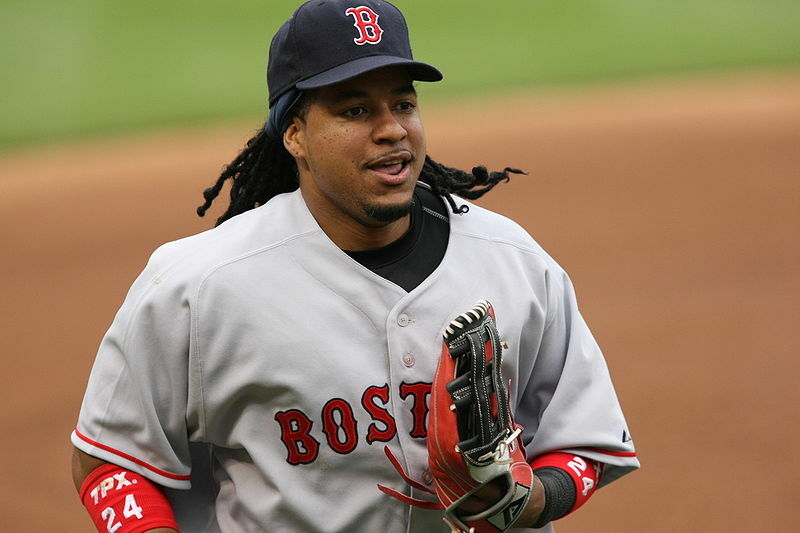 Manny Ramirez was known for his quirky attitude and behavior on and off the field. The resultant incidents are colloquially known as “Manny Moments” or “Manny Being Manny”. 6. Ramirez, besides his unconventional attitude also built a reputation of being someone who was a tireless worker at his hitting. Thus, he became known as one who could hit for both power and average. 7. He is 6 feet (1.83 m) tall and weighs 102 kg.